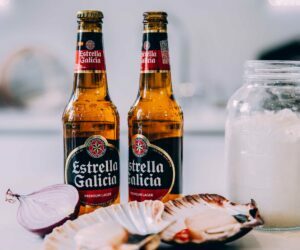 I’ve noticed that scallops are more common in the UK than they are in Spain. I can see them in almost any restaurant and the variations are endless. In my country, we don’t eat them that much. This is perhaps because we have a larger variety of other seafood available. Having said that, this recipe carries a flavour punch. For those who hate anchovies, don’t let the anchovy in the breadcrumbs put you off; trust me when I say that after cooking the anchovy will not taste anything like it does when you take it out of the tin. Warm the milk in a small pan over a low heat. Preheat the grill to 200ºC/400˚F/gas mark 6, or hot. Melt the butter in a medium pan over a medium heat and add the onion and the ham. Cook for few minutes until the onion is soft and transparent, then add the flour and cook for 5 more minutes, stirring continuously, until the flour has a light toasted colour. Add the warmed milk, little by little, and a pinch of salt and white pepper, stirring all the time until you have a smooth and silky white sauce. Lower the heat and simmer for about 15 minutes, stirring from time to time to make sure the sauce doesn’t stick to the bottom of the pan. 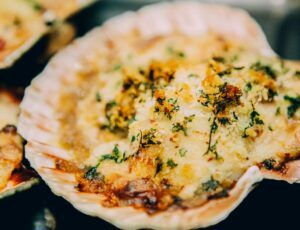 Line up the shells on a baking tray and place a scallop on top of each shell. Cover each one with a couple of spoonfuls of the ham béchamel and sprinkle over the anchovy breadcrumbs. Gratin under the grill for 5 minutes and serve hot.